Glide through dense mangroves and protected wildlife refuges to catch a glimpse of wildlife and marine animals and fish in their natural habitat. Key West kayak tours are diverse in length, time, location, and more. Here are a few of our favorites for you to consider while planning your Key West vacation. Key West Eco Tours offers sailing, kayaking, snorkeling, and paddleboarding packages from the Key West Historic Seaport. Led by local nature guides, Key West Eco Tours take you through mangrove islands, the Florida Keys National Marine Sanctuary, or the Key West Wildlife Refuge. Choose between morning and evening tours, both of which offer a different experience. Go on a four-hour backcountry kayak and snorkel trip, take a standup paddleboard yoga class, or rent a kayak to go out on your own. Lazy Dog Adventures offers Key West kayak tours that leave from Hurricane Hole, Stock Island, which is about four miles from downtown. The two-hour guided tour takes you through the backcountry mangroves where you might catch a glimpse of tropical fish, jellyfish, sea cucumbers, sponges, sea stars, and more. Blue Planet Kayak offers small group tours of no more than 10 people as well as private tours that offer ample opportunity to explore at your own pace. Blue Planet is owned and operated by Chad Bryant, who has decades of experience researching marine life and a background in biology, marine science, oceanography, botany, and bird research. Go on a sunset and starlight tour, which lasts 2.5 hours and takes off an hour before sunset. Experience an entire day with the Sebago’s Island ‘Ting Tour, which includes a sailing cruise, snorkel adventure, and kayak tour of the mangroves. This six-hour tour includes a continental breakfast, full buffet lunch, and afternoon snacks as well as post-snorkeling sangria, beer, and wine. This tour departs from Key West’s Historic Seaport on a seven-mile sail to the coral reef, where you get to snorkel. 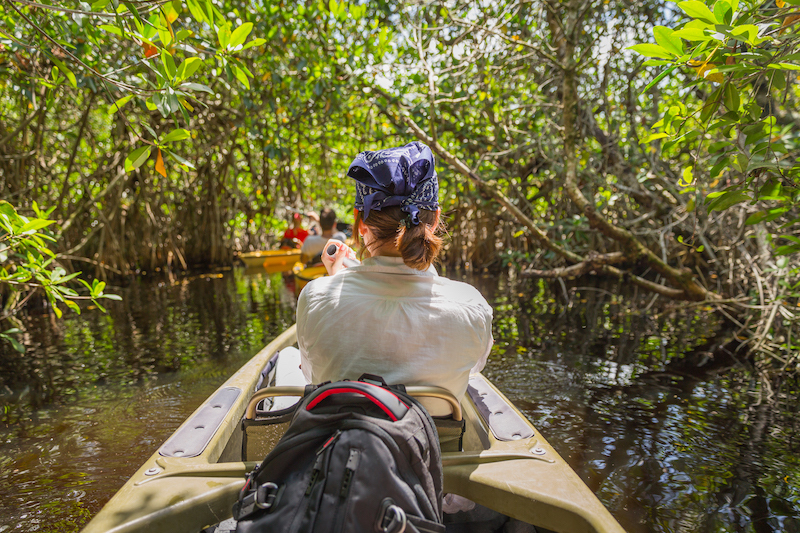 The tour then takes you to the mangroves for kayaking before sailing back to the Seaport. Head out on a two-hour or three-hour guided kayak tour with Kayak Kings of Key West. This company specializes in small group tours so that your experience is personalized and there is plenty of space to ask questions and explore. This Key West kayak tour goes through the unspoiled mangroves along the southeast end of the island where you’ll meander through tunnel-like rivers. Catch a glimpse of starfish, horseshoe crabs, sea anemones, jellyfish, sea hares, and a variety of birds. Key West kayak tours offer a truly unique way to experience the landscape and scenery of the Florida Keys. If you’re planning a Key West vacation, consider booking a kayak tour for your group. Our Key West vacation rentals are ideally located near some of the region’s best kayak spots. Book yours today.